March 31, 2014 - Kane Is Able, Inc. (KANE) has been named the "Thomas P. Kokura Employer of the Year" by The Arc of Luzerne County (Pa.) to recognize KANE's Pittston distribution center for its inclusive workforce. The Arc awarded the honor at its annual awards dinner on March 20, 2014, as part of a celebration of Intellectual and Developmental Disabilities Awareness Mouth. 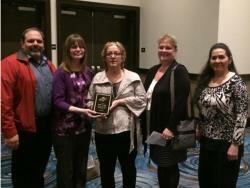 Shown with the award are (from left): Tony Alfieri, Kalstar Operations Manager, Joan Logie, KANE Director of Human Resources, Pamela Zotynia, The Arc, Christine Skutnick, KANE Human Resources Manager, and Karla Porter, The Arc. In September 2013, the Pittston facility began a partnership with The Arc and their Transition to Community Employment (TRACE) program. TRACE is a unique two-year workforce development program that prepares individuals with intellectual and developmental disabilities and autism to successfully enter the workforce and adapt to the demands of today's results-oriented workplace. Six students and their job coach participated in a one-year internship in the contract packaging operation for Kimberly-Clark Corporation. The students gained valuable work skills to prepare them for future employment. "This program has been rewarding for us as we welcomed the students and their job coach to our KANE family. These students are capable and valued members of our team, who have added value to our workforce and our lives," said Veronica Donchez, KANE's Senior Vice President of Human Resources. "We look forward to a continued partnership with The Arc of Luzerne County." The Arc is a private, non-profit organization that is dedicated to improving the quality of life for people with intellectual and developmental disabilities through advocacy, resources, and community education. It is affiliated with The Arc of the United States, and it is a member agency of the United Way of Wyoming Valley. Visit The Arc at www.thearcofluzernecounty.org.